March 11, 2017 (Joseph Thomas - NEO) - Alleged human rights advocacy organisation, Amnesty International, has had several of its recent reports called into question regarding the very real possibility that its "advocacy" work is nothing more than politically-motivated attacks on nations targeted by its Western sponsors. One report published under the titled, "Syria: Human Slaughterhouse: Mass Hangings and Extermination at Saydnaya Prison, Syria," has been revealed to consist of nothing more than opposition accusations and fabricated evidence created on computers in the United Kingdom. Despite Amnesty International's report concluding that the Syrian government committed "crimes against humanity," the report admits it lacked any sort of physical evidence, including access to the facility in which Amnesty claims between "5,000-13,000" people were systematically tortured and executed. While Amnesty's report on Syria is perhaps the most transparent and egregious abuse of human rights advocacy, Amnesty has produced other reports recently exhibiting a similar pattern of deception and lies of omission, preying on public ignorance and emotions, often at the cost of human rights advocacy rather than in defence of it. In their report titled, "Thailand: "They Cannot Keep Us Quiet": The Criminalization of Activists, Human Rights Defenders, And Others in Thailand," attempts to paint a picture of a draconian dictatorship silencing defenders of democracy and human rights. In reality, virtually every individual and group listed by Amnesty International as victims of a supposed "systematic crackdown on government critics," are in fact US-European funded agitators who have not only been deeply involved in subversion versus the Thai state, but who have collaborated with elements among the opposition responsible for violence, terrorism and mass murder. Many of those listed by Amnesty International as "victims" of the Thai government were silent or actively complicit in the violence that unfolded between 2013-2014 when protesters sought the ouster of the US-European backed government of Thaksin Shinawatra and his sister Yingluck Shinawatra. Terrorists backing the Shinawatra regime employed everything from assault rifles to hand grenades and M-79 40mm grenade launchers on unarmed protesters. Yet Amnesty International's report fails to mention any of this background information, intentionally omitting the violence these "activists" were either supporting, or hypocritically ignoring out of political convenience. In fact, Amnesty International failed utterly to report on any of that violence even as it was taking place. It is another example of how Amnesty International's reports selectively target governments the US and Europe seek to undermine or overthrow, and protect those these Western interests support. The reason for Amnesty's omission of these facts is very obvious. It would be very difficult to pass these "activists" off as pro-democracy when they sought to ignore, even silence with force, voices opposed to the political party they work for. It would be likewise difficult to pass these "activists" off as human rights advocates when they remained silent amid street violence carried out by their political allies and sponsors. 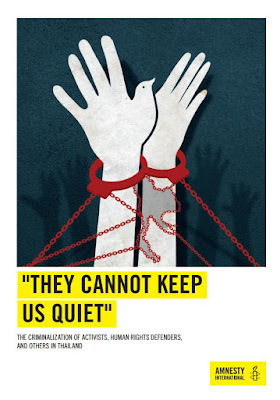 Through the lens of actual history, the "activists" Amnesty International's report attempts to paint as victims, use human rights advocacy as a selective tool to advance their own agenda, ignoring rights violations when politically convenient, and staging attention-seeking protests citing human rights violations when politically expedient. Virtually every "activist" in Amnesty International's report is a verified recipient of US and European political, financial and material support. Organisations like Prachatai are mentioned repeatedly throughout the report, but their funding from the US State Department, convicted financial criminal George Soros through his Open Society fund and other foreign sponsors is never mentioned once. Mentioning it would cast doubt on the organisation's actual agenda versus the agenda Amnesty's deceptive report attempts to assign to it. Amnesty International is but one example of so-called "international" organisations that pose as advocates for human rights and democracy, while in reality is merely hiding behind such principles to advance a very specific and self-serving political agenda. While Amnesty is constantly showered by awards, accolades and praise from the very system it serves, it is causing irreparable damage to not only the West's supposed reputation of upholding human rights globally, but irreparable damage to the very concept of human rights advocacy itself.